NEW YORK (AP) — There was a time, after a spectacular prison escape, when Joaquin Guzman was the most wanted man in the world. Some days, they are just two people among all the prosecutors, reporters, security officials and team of lawyers who fill up the courtroom. Other days you may see five. They sit up straight in the spectator area and look up so they can see Guzman’s face. They also look with curiosity at his wife, Emma Coronel, who sits in the courtroom’s public gallery nearly every day. “It was surreal. 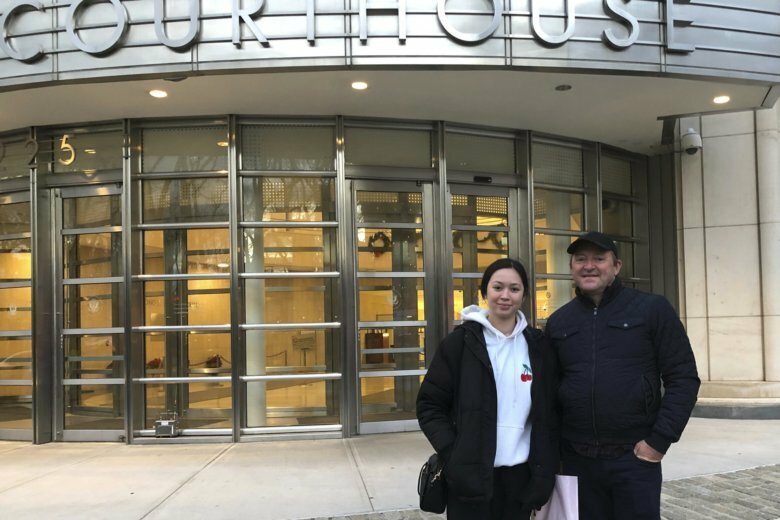 It was like I was seeing the (Netflix) TV show ‘El Chapo,'” said spectator Peter Stolt, 23, who attended three days of the trial in November and hopes to show up for at least one more. Stolt, who recently graduated from Muhlenberg College in Pennsylvania and is interviewing for jobs in New York, said he has stood in line outside the building at around 6:30 am to make sure he gets a seat. What impressed him most, he said, was when Miguel Angel Martinez, a former assistant to Guzman who is now a prosecution witness, testified in dramatic detail how he survived several attempts on his life that he claimed were ordered by Guzman, one after an ominous serenade by a Mexican brass band. “The grenade, the song. … It’s crazy. That was scary. It’s crazy that we are hearing this firsthand,” he said. The diminutive Guzman, whose nickname means “Shorty” in Spanish, was extradited to the United States last year to face charges accusing him of running the Sinaloa cartel, which smuggled tons of cocaine into the U.S. The six weeks of testimony from law enforcement officials, an imprisoned cocaine kingpin from Colombia and flashy Mexican drug smugglers have contained enough material to fill several seasons of “Miami Vice” or “Narcos.” There has been testimony about secret smuggling tunnels built beneath the border, assassination attempts, bribery of high level police officials, private jets filled with millions of dollars in cash, and factories churning out cocaine-filled cans disguised as hot pepper containers. Guzman’s lawyers say the lowlife cooperators are lying in an attempt to frame him and get an easier sentence in their own drug-trafficking cases. “It took me a couple of seconds to realize it was him. To be honest, he looked like … a regular person,” he said. He was more impressed by Coronel, Guzman’s wife, who he thought walked around the courtroom confidently, as if she were in her own home. She sat in a bench in front of him. “I could smell her perfume,” said Martinez, who owns and manages several restaurants in New York. Hearing phone recordings of drug dealings in the courtroom impressed him, he said, but also when prosecutors showed as evidence a photograph of Amado Carrillo, a Mexican drug lord who is famous in his home country and who died in 1997 in a plastic surgery operation to change his face. “The amount of drugs, the amount of money … these are extraordinary levels,” said Burg, who ended up with his daughter in the overflow room, watching on a video feed, because there was no space in the courtroom. “We had a great holiday, but the case was one of the highlights!” he said. Some members of the jury have dozed off when technical aspects of law enforcement drug searches have been explained. Guzman, however, always seems to pay attention, looking at witnesses when they speak and whispering to his lawyers’ ears.